What value do airlines place on perceived quality and branding in Y class seating? In this highly competitive market sector, cost, weight, durability and availability are the main drivers behind airlines’ purchase decisions. Is there really a need to push for higher perceived quality or have we reached an acceptable plateau with no real need for improvement? Project Surface is an initiative by aircraft seating company, Pitch, aimed at exploring enhanced surface finishes and branding on the PF3000 economy seat. “We are always looking at ways to make a difference and test the marketplace with new ideas,” says Pitch director, Gary Doy. “When we look at business and first-class offerings we see significant improvements in craftsmanship and attention to detail setting new standards and driving up customer expectations. We want to open a conversation with airlines about economy class and listen to their feedback”. Take as an example, a short haul low-cost airline which needs to upgrade the cabin on five of its single-aisle aircraft. It has sharpened its brand and product offering, and spent some money preparing a new marketing campaign, but still needs the cabin to deliver the vision. The layout has changed to a high-density 28in pitch to get the best return on investment, and the old seats won’t cut it as they are too bulky, too heavy, and they recline. The marketplace is shifting towards lightweight fixed-back seats, but the marketing department is reluctant to go this way because the airline has always had recline seats, and they are unsure if passengers will accept fixed backs. However, there is a gut feeling that at a tight pitch, it is an advantage for passengers to have a fixed seat as it gives them much more space and causes less arguments during flight. The airline asks seat manufacturers to provide a sample of their latest and greatest, so their products can be evaluated side by side. 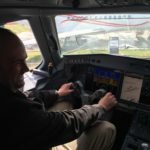 All the seats are set at a 28in pitch, as are the current reclining seats, and teams from throughout the airline, as well as its top 25 customers, spend over four hours trying out the seats to conduct a comprehensive review. It soon becomes clear that the fixed-back seats designed specifically for a tight pitch provide significantly more passenger space and feel more robust. The Pitch PF3000 seat is one seat on trial, a fixed-back design with a few more inches of recline compared to the standard seat in TTL position, and the curved seatback gives more legroom. It feels spacious, with a solid, well-built feel and a stylish look – and the airline decides to go with the PF3000 and work with the Pitch team to brand the seats. They opt for a wipe-clean dress cover and branded antimacassar and, as part of the package, the Pitch team also helps with carpet and curtains selection. Photorealistic images of what the finished cabin will look like with all the correct materials are prepared, and even a virtual reality tour of the cabin. The standard seats come with some great plastic finishes, but technical grains with metallic and pearlescent finishes add another level of individuality. Even as an LCC, the airline has always seen itself as more Audi than Skoda, so to offset the reduction in seat pitch it opts for the high-end plastic finishes and a more detailed dress cover design, balancing the product offering and setting it apart from the competition. There is no guarantee this will win more customers, but the airline believes this investment reinforces its brand values and, as with automobiles, the bar is always being raised higher and it wants to be ahead of the trend. Project Surface explores high-end surface finishes and branding on the PF3000 seat with an aim of increasing the perceived quality and exploiting the brand-ability of the seat. Changes are restricted to material finishes and the dress cover design, with the results shown on a standard triple seat. As the components on the seatback are thermoformed, there are some valuable opportunities to change the grain and color, with a relatively low minimum order quantity. Pitch has been working closely with its supply base to develop a design scheme to further enhance the aesthetic appeal of its seats, using certified plastic finishes more usually associated with business and first-class products. Toughness and durability in service are obviously critical aspects, but Pitch designers also wanted a low-gloss appearance on molded plastic parts and found the Boltaron range of sheet products ideal. Within the standard extruded plastic range there are several surface textures, but if press lamination finishes are selected, an even wider range is available. Pitch selected some technical grains and metallics for the design scheme and, in partnership with Balform, trialled the material on the existing tooling to produce the first parts. This flags up the critical importance of inter-relationships with the supply base; while molding different grains and colors requires an understanding of the complex behavior of the different materials, marrying the best texture to the part needs careful, considered design-for-use input. The standard plastic colors are designed to complement the color palette offered by the main aircraft manufacturers. Many individual combinations are possible, but for the initial design scheme, a dark technical grain with a metallic finish for the tray table and literature pocket is selected, which contrasts with an anthracite metallic backrest molding. The different textures and colors work well together, adding another level of perceived quality to the product. The seat cover offers airlines one of the best opportunity to express their brand. The PF3000 has a laminated dress cover, providing a consistent finish with great in-service durability. Multi-layered foam can be used to emphasize specific areas of the dress covers, giving them a more comfortable look and feel. Together with dress cover supplier, Sabeti Wain Aerospace, Pitch has developed a range of pre-engineered dress covers. The ‘Standard’ lightweight dress cover is currently supplied in faux leather, while the mid-range ‘Comfort’ cover uses E-Leather, with additional padding and feature lines in the headrest and lumbar area to emphasize the softness. Contrasting stitch detailing and fluid style lines are used to reinforce the three-dimensional nature of the curved seatback to give this dress cover a well-tailored look. The ‘Premium’ dress cover comes with contrast auto-stitch detailing and an integrated headrest. Branding the seat with an airline’s logo is often discussed; however this request is not as simple as it may seem. Branding directly on the dress cover can cause alignment issues, and if the seat is being purchased via a leasing company, there is often a preference to leave branding off the seat for commercial reasons. A popular option is to brand the antimacassars instead, as they can be changed separately from the dress covers, and some airlines are already using high-end leather antimacassars with printed branding applied during the manufacturing process. To give airlines a further branding opportunity the PF3000 has a badge on the tray table latch and aisle-side hanger cover that can be changed to show the airline’s brand if required. The PF3000 is designed so it can be easily recycled. The plastic vacuum-formed moldings can be separated from the metal structure, allowing both materials to be recycled at the end of the product’s life. It also allows easy replacement of the plastic in service, if damaged.